Where in Puerto Rico Do Coqui Frogs Live? The singing frogs of genus Eleutherodactylus, also known as coqui, are a national symbol of Puerto Rico. These tiny amphibians are named after their distinct mating call. People on the island fall asleep to a nightly chorus of "co" and "kee" sounds that lasts from dusk to dawn. For Puerto Ricans, the sight and sounds of coqui are just a part of daily life. The frogs are prevalent throughout the island, reinforcing their identity as the country's endearing symbol. Some residents even denote their national identity by labeling themselves "as Puerto Rican as a coqui" to foreigners. 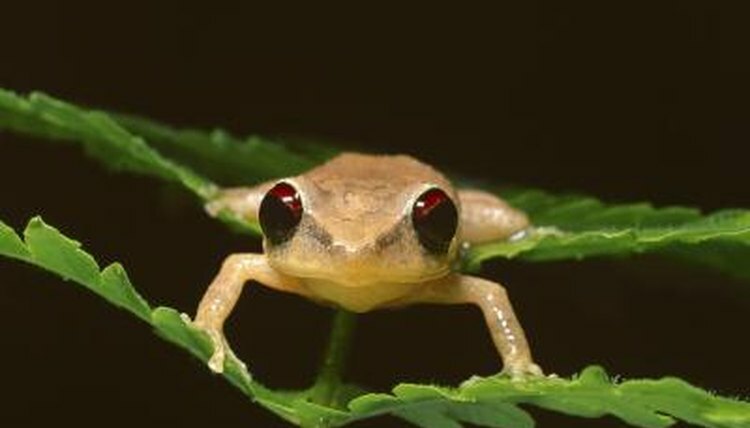 Coqui are found in habitats across island, all of which falls into the tropical climate zone near the equator. The only exceptions are extremely dry localities and elevated areas of the island that exceed 4,000 feet above sea level, according to Animal Diversity Web. Unlike many other frog and amphibian species, coqui are not restricted to excessively moist or aquatic environments. Their life cycle lacks the distinct tadpole stage that many other frog species go through as they develop. This means that coqui eggs don't need to be laid in or near water, which gives adults greater freedom to wander about the island. Coqui tend to mate and reproduce during Puerto Rico's wet season as the eggs still need plenty of moisture to survive. Breeding can occur during any month, though, so adult male frogs can be seen caring for unhatched eggs throughout the year. While coqui are often found clambering along the branches and trunks of trees, they are no strangers to human habitations. You may find these dainty frogs inside local greenhouses, under porches and even inside the house. Adults seek out secure areas, like holes in trees or old bird nests, as shelter for their eggs after mating. Coqui tend to scale trees to sing at night and descend into the cover of bushes, shrubs and grass during the day to avoid predators, according to the National Wildlife Federation. Coqui are well-adapted to the tropical environment of Puerto Rico, which also makes them a prime candidate for invasion of similar ecosystems. Some species have already created problems on islands as far away as Hawaii. While the frogs are excellent pest-controllers in their homeland, they are a dangerous threat to native species in other regions. The coqui invasion of Hawaii has sparked concern among conservationists and there has been concerted effort to control the invasive population there. Despite their hardiness in their native habitat, coqui are currently assigned a "near threatened" status in Puerto Rico. Where Does the Pinocchio Frog Eat?